For those of you craving some more nuggets of creative advice after the Cannon Hill Lectures, or for fresh faces seeking career navigation within the arts, look no further than a fresh series of brand spanking new Creative How To sessions, presented by mac birmingham in partnership with Amy Martin & Bearheart. The Creative How To sessions aim to demystify the creative and cultural sector helping to find a route in, whether as an employee, freelancer or as an entrepreneur. Steve Jobs was a loser, well he lost a company and countless opportunities before gaining big time as the boss of Apple. 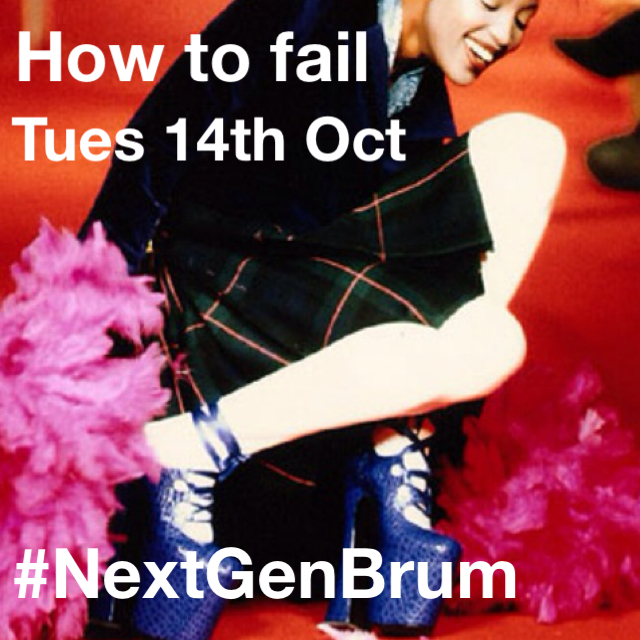 In this session we’ll look at the positives behind failure and how to pick yourself up after a bump in the road. Toast or cereal toast or cereal… Do you ever find it hard to make a decision? Maybe you’re not sure if you should go to Uni or perhaps you’re flummoxed by another of life’s options. This session will help you develop the where-with-alls to make a decision and the conviction to stick to it. Being able to lead a workshop is a brilliant skill to add to your metaphorical tool box. In this session we’ll look at the art of creative facilitation and how you can develop workshops from your creative passion. In this session we’ll look at the deadly important skills of project management and how to wrestle a budget into submission. Knowing these skills will raise you head & shoulders above the competition. Without creativity – creative problem solving, creative thinking – we don’t have a hope of making a positive difference in the world. We need to think outside of the box to come up with real, innovative, workable solutions to the problems that face us. In this session you’ll meet artists who are making positive changes in society and explore how you can too. Your time is being zapped up by The Internet and the zillions of other distractions in life so how do you make the time to do the important stuff? This session looks at the practical skills of time management and reveals that there IS enough hours in the day! We want to know the story behind why you do what you do. Whether you have artwork to sell or an audience to entertain, people are far more likely to engage and connect if you deliver a well-crafted story with an emotional core. This session will help you to craft that story so people will listen. Creatives don’t have a right to make money just an opportunity. In this session we’ll explore the business of creativity and the practical knowledge of tax, insurance, self employment and getting legally set up as a new business. Are CVs old hat? In this session Top employers from arts & cultural organisations share their experience of hiring and firing creative talent and what they’re really looking for in an employee. What’s to gain from having bags of subscribers to your YouTube channel or thousands of followers on Instagram? In this session we’ll hear from arty types who are big on The Internet, discuss the benefits of having an online following and figure out how you build an online fan base.